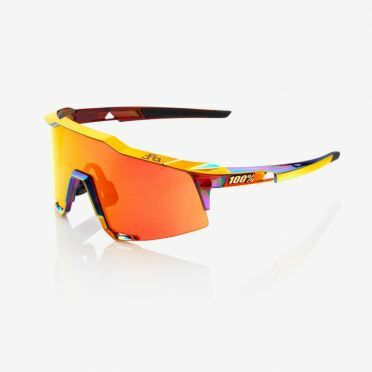 The 100% Speedcraft glasses yellow with mirror lens is fully loaded with our most advanced technology for the ultimate in sports performance. 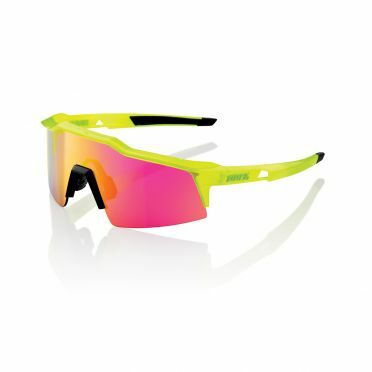 The eyewear of choice for world champion cyclist Peter Sagan! The signature 100% lens with its cylindrical shield features. A lens technology that significantly increases vertical visibility in the riding position. Megol rubber nose and temple pieces help provide all-day comfort while the lower air scoops increase ventilation and reduce moisture on the lens. The 100% Speedcraft glasses grey/green with mirror lens grey is fully loaded with our most advanced technology for the ultimate in sports performance. 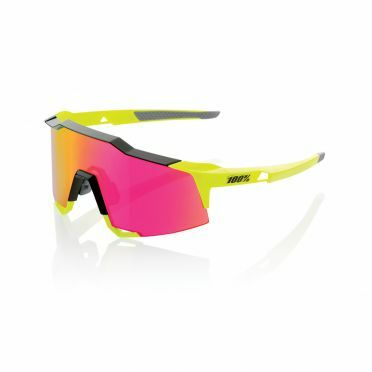 The eyewear of choice for world champion cyclist Peter Sagan! The signature 100% lens with its cylindrical shield features. A lens technology that significantly increases vertical visibility in the riding position. Megol rubber nose and temple pieces help provide all-day comfort while the lower air scoops increase ventilation and reduce moisture on the lens. 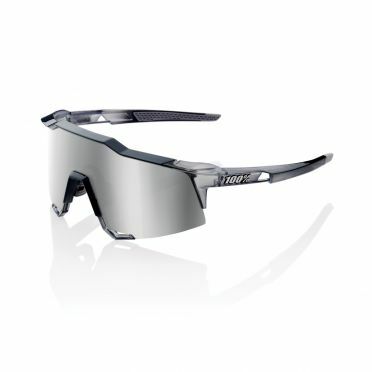 The 100% Speedcraft glasses polished crystal grey with hiper lens grey is fully loaded with our most advanced technology for the ultimate in sports performance. The eyewear of choice for world champion cyclist Peter Sagan! The signature 100% lens with its cylindrical shield features. A lens technology that significantly increases vertical visibility in the riding position. Megol rubber nose and temple pieces help provide all-day comfort while the lower air scoops increase ventilation and reduce moisture on the lens. 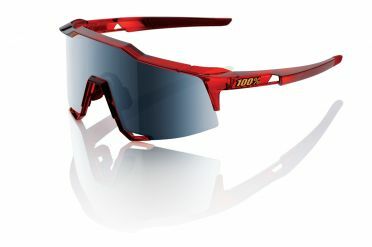 The 100% Speedcraft glasses chromium with hiper lens red is fully loaded with our most advanced technology for the ultimate in sports performance. The eyewear of choice for world champion cyclist Peter Sagan! The signature 100% lens with its cylindrical shield features. A lens technology that significantly increases vertical visibility in the riding position. Megol rubber nose and temple pieces help provide all-day comfort while the lower air scoops increase ventilation and reduce moisture on the lens. 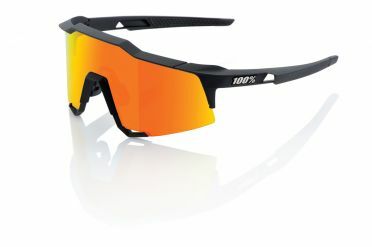 The 100% Speedcraft glasses black with hiper lens orange is fully loaded with our most advanced technology for the ultimate in sports performance. The eyewear of choice for world champion cyclist Peter Sagan! The signature 100% lens with its cylindrical shield features. A lens technology that significantly increases vertical visibility in the riding position. Megol rubber nose and temple pieces help provide all-day comfort while the lower air scoops increase ventilation and reduce moisture on the lens. 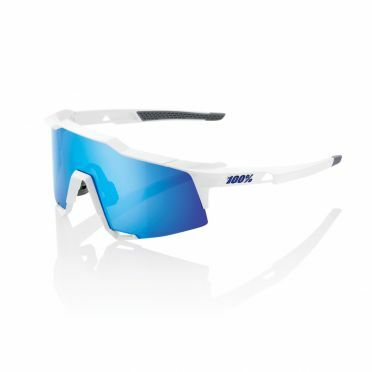 The 100% Speedcraft glasses white with hiper lens blue is fully loaded with our most advanced technology for the ultimate in sports performance. The eyewear of choice for world champion cyclist Peter Sagan! The signature 100% lens with its cylindrical shield features. A lens technology that significantly increases vertical visibility in the riding position. Megol rubber nose and temple pieces help provide all-day comfort while the lower air scoops increase ventilation and reduce moisture on the lens. The 100% Speedcraft glasses acidulous with SL mirror lens offers all of the performance features of the standard Speedcraft, in a sleek and compact package. The cylindrical shield lens comes with stock with 100% lens with Topview technology and offers everything you need when it comes to clarity, protection, and durability. Rubber nose and temple pieces provide all-day comfort while the temple arm scoops form a secure fit and help manage moisture. 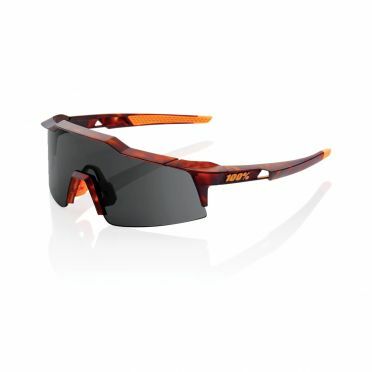 The 100% Speedcraft glasses havana with SL lens matte dark offers all of the performance features of the standard Speedcraft, in a sleek and compact package. The cylindrical shield lens comes with stock with 100% lens with Topview technology and offers everything you need when it comes to clarity, protection, and durability. Rubber nose and temple pieces provide all-day comfort while the temple arm scoops form a secure fit and help manage moisture. 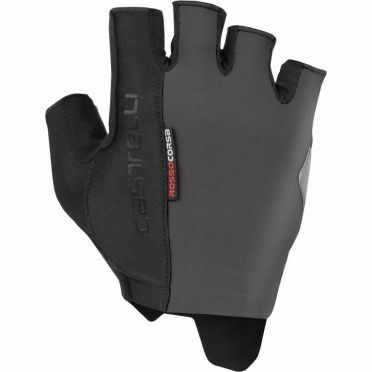 The lightweight Castelli Rosso Corsa Espresso glove grey men with gel padding and grippy silicone are a great option for tough roads and warm weather. The close fit, stretchy material will feel secure through technical corners and ensure all-day comfort on any roads. A textured mesh fabric back is stretchy and holds it's shape close to the skin, so the gloves are easy to get on or take off but won't let your holds slide around. Tip: keep in mind that the Castelli clothing fits smaller than normal. The 100% Speedcraft glasses soft tact graphit with mirror lens is fully loaded with our most advanced technology for the ultimate in sports performance. 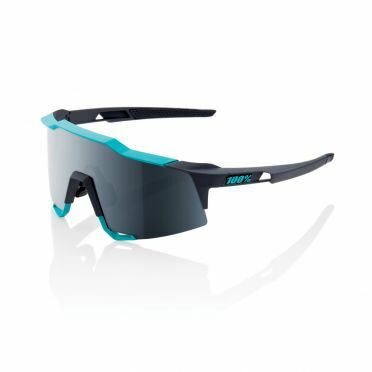 The eyewear of choice for world champion cyclist Peter Sagan! The signature 100% lens with its cylindrical shield features. A lens technology that significantly increases vertical visibility in the riding position. Megol rubber nose and temple pieces help provide all-day comfort while the lower air scoops increase ventilation and reduce moisture on the lens. 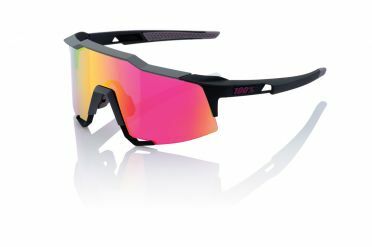 The 100% Speedcraft glasses cherry palace with mirror lens is fully loaded with our most advanced technology for the ultimate in sports performance. The eyewear of choice for world champion cyclist Peter Sagan! The signature 100% lens with its cylindrical shield features. A lens technology that significantly increases vertical visibility in the riding position. Megol rubber nose and temple pieces help provide all-day comfort while the lower air scoops increase ventilation and reduce moisture on the lens. The 100% Speedcraft glasses white with hiper lens soft orange is fully loaded with our most advanced technology for the ultimate in sports performance. The eyewear of choice for world champion cyclist Peter Sagan! The signature 100% lens with its cylindrical shield features. A lens technology that significantly increases vertical visibility in the riding position. Megol rubber nose and temple pieces help provide all-day comfort while the lower air scoops increase ventilation and reduce moisture on the lens. 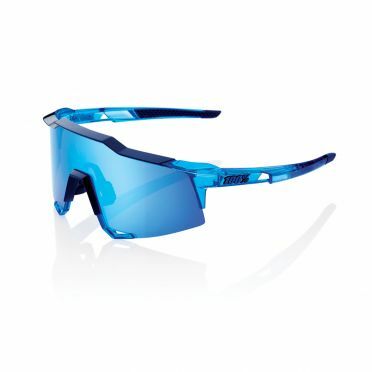 The 100% Speedcraft glasses polished crystal blue with hiper lens blue is fully loaded with our most advanced technology for the ultimate in sports performance. The eyewear of choice for world champion cyclist Peter Sagan! The signature 100% lens with its cylindrical shield features. A lens technology that significantly increases vertical visibility in the riding position. Megol rubber nose and temple pieces help provide all-day comfort while the lower air scoops increase ventilation and reduce moisture on the lens.